Should you skip moisturizing if you have oily skin? By not moisturizing, your skin can actually end up over-producing oil to compensate for the moisture it isn’t getting, which means your skin can end up 10 times oilier! This can also happen with harsh, sulfate based cleansers. Opt for a gentle, sulfate free foaming cleanser (or a cleansing oil) and use a light, oil free moisturizer daily. Also, oily skin is prone to breakouts & acne, choose light water-based products that don’t clog the pores. Check if it’s labelled ‘noncomedogenic’. Noncomedogenic are skin care products that do not block pores. I have combination n acne prone skin. Is jojoba oil advisable? What kind of oils would suit such a skin type. Thanks in advance! Yep – jojoba oil is advisable for acne prone skin.The oil that comes from the jojoba seeds closely resembles our own skins sebum. 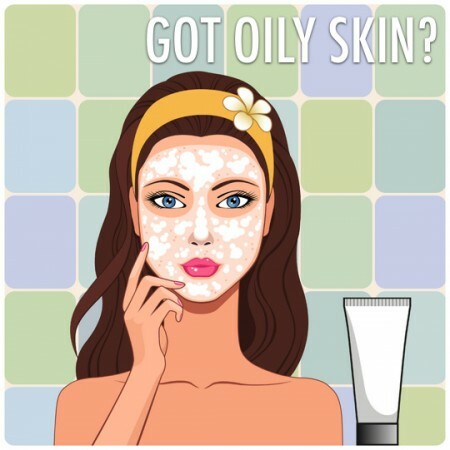 It sort-of tricks your skin into thinking it is already producing enough oil, so it stops producing more and therefore leaves your skin less oily. The oil has a calming & soothing effect on your skin & over time, you will notice that your skin begins to have a beautiful glow. To make a spot treatment, mix a few drops of jojoba oil with a few drops of tea tree oil & apply directly to a pimple. Tea tree oil is a natural antibacterial that is often used to fight acne. Keep tea tree oil away from the eyes. Be sure to buy only pure, cold-pressed jojoba oil, which is commonly found in health food stores. Also, if too much jojoba oil is used, it is possible that your acne can worsen, since the excess oil sits on top of the skin and can attract dust and dirt. When using jojoba oil as a moisturizer, it is important to only apply a few drops or as much as your skin can absorb. I’d like to add that although everyone should use a moisturizer whether or not they have dry/combination/oily skin (this is coming from someone who’s had acne since about 5th or 6th grade), looking for a product that won’t clog your pores is more than just looking for a “noncomedogenic” label. There is no regulation regarding whether a product can be called “noncomedogenic” or not. You have to actually look at the ingredients to see if there’s anything comedogenic in the product. You can use websites like cosdna.com to help.